Atop Shenkuu's largest mountain lies the legendary Sword of the Moon, an artefact that Princess Terrana has taken upon herself to retrieve to prove she's ready to be a warrior to her father. Armed with nothing but a grappling hook, Terrana starts her journey up the mountain moving from ledge to ledge, trying not to think of the very, very long fall below her. In Shenkuu Warrior (not to be mistaken for Shenkuu Warrior II), you don't actually control Terrana, instead you use the mouse to control where she throws her grappling hook. Aiming the grappling hook can be tricky, because it doesn't necessarily throw where you click, instead you aim it with the device at the bottom of the screen. 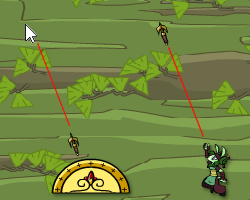 Terrana throws her grappling hook in the same line of direction that the device is pointing, but shifted to her position so that the end point is unlikely to be where your mouse is. Once the grappling hook makes contact with a ledge, Terrana will be pulled to it and propelled into the air above the ledge. The further you are from the ledge you grab onto, the further you'll fly above it. Be cautious as these platforms are too thin for Terrana to land on, so she'll need to keep quickly grabbing on to other ledges to avoid falling. If Terrana falls out of the bottom of the game screen, you'll have to restart the level! Shenkuu Warrior has an infinite number of levels, each of which is broken into three different types of terrain; forest, rocky and snow. Each span a third of the level and have no gameplay difference between them, they are just an indicator of how close to the finish you are. The end of each level is found at the top of the snowy peak of the mountain and once it has been reached, you move onto the next level. There are no changes between each level of the game, the levels just get longer, which means you'll have to climb more ledges without falling. Don't be too worried about falling off the mountain, Terrana just goes back to the start of the level and starts climbing again. There are no lives or time limits in this game, so feel free to fall as often as you'd like! Scoring in Shenkuu Warrior depends on how high you can climb each mountain, so the higher you climb, the more points you score. Each time you fall or complete a level, your current score will be shown and you can choose to attempt the level again or quit and send your score. Finishing a level saves your current points so that you can't drop below that score in the next level. If you choose to retry a level, you will lose any points earned on your last attempt. The first and most important thing to remember about Shenkuu Warrior is that there are no lives, no time limits, no restrictions on how much you can play, so take your time and practice. Controlling the grappling hook can take some time to adjust to, especially if you've played Shenkuu Warrior II previously. To propel yourself as far as possible with the hook, you should let Terrana fall towards the bottom of the screen and aim to hit a ledge as close to the top of the screen as possible. 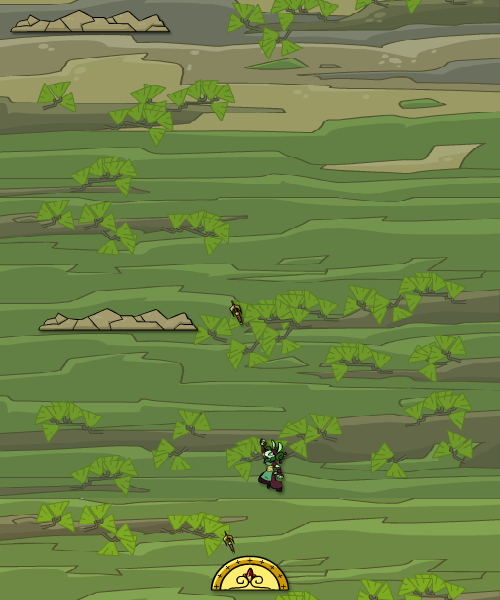 While letting Terrana fall, be sure to allow enough time for the grappling hook to travel to the ledge; if Terrana falls off the screen before the hook connects, it will disappear and you'll have to retry. The most conveniently placed ledges are the ones directly above Terrana, grabbing these will send her in a straight line upwards and set you up for an easy grab afterwards. Grabbing a ledge on the opposite side of the screen to Terrana will cause her to bounce off the sides of the screen quite rapidly and this makes it incredibly difficult to land the grappling hook on another ledge if she doesn't stop moving. If you're bouncing off the walls too much, try to land a hook on a close-by ledge and keep hooking on to it to keep Terrana still. Try not to accidentally click outside of the game window when swinging around!